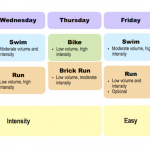 Consistency is the most challenging aspect of training facing any triathlete. Interval sessions hurt in the moment, but they’re done in a matter of minutes. Consistency is built over days, weeks and months. It’s a familiar topic; only a few weeks ago I wrote about pulling the pin on training and on training more or less. I keep returning because it is so important to a triathlete’s progress and it is the single most difficult area to manage. 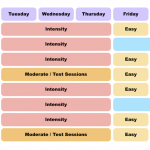 Themes for this blog are frequently drawn from my own training or feedback from my athletes. I’m familiar with the difficulties a busy job, a family and life in general throw them every week. Sessions get missed or are under performed; it happens and we move on. I had a personal reminder of the impact of life on training over the weekend. The real challenge of not pulling the pin and staying on track. By some standards I failed. My training has picked up with the improving weather. I’m pleased to see that reflected in my athletes too. There’s a keenness to train and prepare for the season ahead. None of us seem to feel we’ve done enough; we’re all playing catch up. An honest appraisal often clarifies the matter; we can strip away the negatives and see the positives around us. I may believe I’m not training enough, but I see performance on the bike similar to my Kona build. Is that behind the curve? Athletes inflate the negatives and ignore the positives. Miss a trivial session and the week becomes a failure. We consider our performance in isolation. An athlete tells me, “I had no legs on my long ride this weekend.” Then comments, “maybe it was because I was out drinking till late the night before?” Maybe… I don’t want to suggest a monastic, tee-total life style and 9pm curfew is necessary. 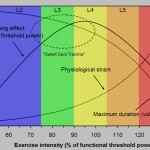 Life stresses are also genuine training stresses. This excellent article by Jesse Kropelnicki neatly sums up this point. The week started really well and continued in the same vein. By Wednesday I’d completed two strong rides, one a little tired, but both far better than the previous month. Then life got involved. Family issues that put triathlon in perspective; circumstances under which training was a low priority. It hit me hard. I logged two zero days: no training. Life stress shot through the roof. I had time and energy, but training didn’t seem important. The Sunday Tri Club ride got me out the door, but I lacked motivation. I was happy to potter along and enjoy a coffee stop on route. It was good to escape and be active, but I’d no urge to do more. As stress levels lower I’m aware I need to get back on top of things quickly. I need to put aside the issue and use my time productively. Life continues and training is a big part of that. I can and have been training well. This small blip – a tiny set back in the overall scheme – is disappointing. Realistically my priorities were straight. There was never a choice. The weekend is behind me. The lost training is gone and cannot be reclaimed. I pulled the pin and had moments of weakness (one involving a pack of biscuits!) It’s a moment in a long journey and there are positives. I rested. I slept more and feel genuinely refreshed. I recognised that this was an area I’d fallen short on of late. As my motivation returned I had not matched my recovery to my work load. Recognise that consistency is the hardest part of training. Life seriously impacts training. We should try to minimise the stresses in our control, but appreciate not everything is. Life happens. As someone who has made triathlon their life sometimes I have to appreciate there’s more than just this sport.